Miami Law’s Inter-American Law Review will host their annual symposium on Friday, February 6 from 8:30 a.m. to 3:00 p.m. at the University of Miami School of Business. 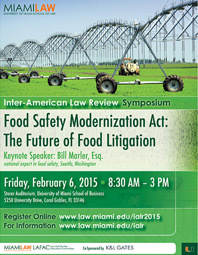 The symposium will address the Food Safety Modernization Act (FSMA) and will feature keynote speaker William Marler, an accomplished attorney and national expert in food safety. Topics of interest will center around the FSMA’s import and transport regulations, FSMA’s impact on domestic and Inter-American agribusiness, and the effect that FSMA’s rules will have on food litigation in the future. Keynote speaker Marler has become the most prominent foodborne illness lawyer in America and a major force in food policy in the U.S. and around the world. The 2011 book, Poisoned: The True Story the Deadly E.coli Outbreak that Changed the Way Americans Eat, by best-selling author Jeff Benedict, chronicles the Jack in the Box outbreak and the rise of Marler as a food safety attorney. Jim Prevor, widely recognized as a leader in understanding and assessing the state of the perishable food industries. The symposium is sponsored by K&L Gates and Miami Law and funded in part by the Law Activity Fee Allocation Committee. The event is free and open to the public.